The reports from the New Orleans says that Americas legendray star Fats leaves the world.His death was confirmed by his daughter saying he died peacefully all around his family members. Domino was the youngest of siblings.He started is casual jobs working on an ice truck.He learned piano from his brother-in-law and piano was his major skill. 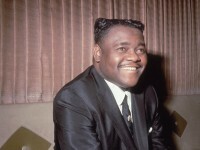 The inspiration for many,Fats Domino began his music career in 1949 and band together with trumpet player and Dave Bartholomew and released his very first record “The Fat Man”. This record was the first rock n roll record and sold a million of copies within a year. He was presented with the Grammy Lifetime achievement award back in 1998 and later was among the first inductees into the rock and roll hall of fame.He was the first of those artists to achieve this honour. Among his greats records are “Blueberry Hill”,”Aint’t That A Shame” and “Valley Of Tears".